Swim with the dolphins in our picturesque facility at Akumal Bay. This once in a lifetime experience will let you touch, hug, shake hands and kiss a dolphin. 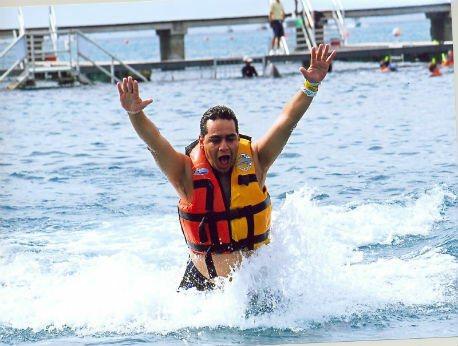 You will also experience the thrill of having two dolphins propel you through the water for the ultimate adventure! Feel like royalty and experience the joy of swimming with dolphins while in a tropical paradise with our Dolphin Royal Swim. This hour-long experience will allow you to make a lifetime of memories by getting face to face with these remarkable creatures while swimming in our dolphin habitat on the Mayan Riviera. The location is conveniently situated just 20 minutes south of Playa Del Carmen or 20 minutes north of Tulum in Akumal Bay. This biodiversity reservation will take your breath away, offering a stunning view of the Caribbean Sea. Each of the dolphins in this facility was born under human care, so they are excited to meet you and your family! But the facility is just the beginning. The dolphins are the real stars of the show and you are going to get the chance to meet them up close! On this tour, you will be actually getting into the water to swim with the dolphins. While swimming with the dolphins, you will be able to touch, handshake, hug and even kiss these majestic animals and the fun doesn't stop there. On this Dolphin Royal Swim, you will get the once in a lifetime opportunity of performing a foot push. During the foot push, you will have a dolphin under each of your feet and they will propel you through the water for the ultimate thrill experience. You will also have the opportunity to hold onto the dorsal fins of two dolphins and allow them to pull you through the water, truly letting you feel the joy of swimming just like a dolphin. This tour is an amazing opportunity to take in the natural beauty of the Mayan Riviera while getting to know these famously friendly creatures and create special memories that you can treasure for years to come. In Dolphin Akumal groups have a maximum of 10 people for a closer experience and will interact from a special underwater platform. Roundtrip transportation from the following hotels: Dreams Tulum, Pavo Real Beach Resort, Gran Bahía Principe Resorts, Oasis Tulum, Akumal Caribe, Villas Akumal, Akumal Beach Resort, Grand Sirenis, Grand Paladium Resorts, El Dorado Seaside (Request your transportation by email to customercare@dolphindiscovery.com or by phone 24 hours before the program) Additional $16 USD per companion.